The cockerel was sat on a wall outside a Lock Keeper's cottage on the Leeds & Liverpool Canal. Although I was stood fairly close I used a lot of zoom to get a good tight head shot. Apologies for the title, I couldn't resist! Wow, that is one good lookin' rooster; Chanticleer look out. It's a beautiful shot. Great lighting, perfect exposure, nice capture of the textures in comb and feather. This an outstanding image which displays great color and above average detail. Congratulations on your win and perfect entry. I don't know if I would eat chicken after looking at this. I do like the picture. The focus is right on! Fowl fanciers should like it too. Never resist a pun -- the strain is unhealthy. Congratulations Bod, I loved this photo and I'm very glad you won. Congrats ! This is a MOST awesome photo in every way !!!! I'm so happy you won ! Way to go Bod... You're on roll my man !!! One of my favorites this week. Message edited by author 2003-03-03 00:02:22. Good one...well exposed showing good detail in the feathers. The eye could be a little better exposed though. I like the way the comb is translucent. Great color! And you left room for text! Very ncie. 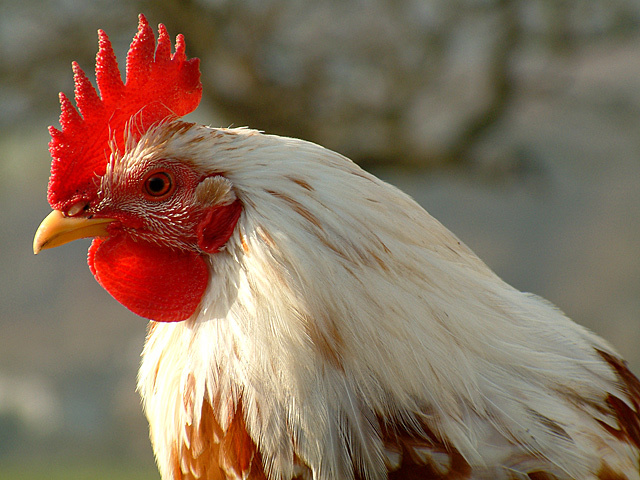 Nice portrait of a rooster. The combs stand out so brightly. The background is perfectly blurred. Not amazingly appealing, but technically very good. Great shot, one of my favorite. The colors are awesome. It appears that it might be just a little over-sharpened but that could just be the roosters comb too. I love the title! A great shot, excellent detail, color and clarity. I like the blur to the background, it keeps your eye on the subject. Nice and sharp with great color and DOF. Nice work! Like the DOF on this and the lighting as well. 8. Clever, very clever! Beautiful lighting, nice chicken. Nice shot. Great stock photo. 9. LOL - love the title, it made me laugh. Clarity and subject is brilliant. I also love the dof. Not too much and not too little, dof is just right. Excellent work and GL. What a shot! I love the detail of this bird. Look at those red eyes! This is most definately a money shot. Great job. - Excellent DOF! Perfect lighting and exposure. This is an excellent image for stock photography in that the exposure is on the money and the image is razor sharp. The only thing I would add is to crop it less so that a photo editor has room to work with it. Very nice image. Now I KNOW how hard it is to get a chicken to stand still, and the roosters are worse, perpetual motion machines. want to come take some portraits of mine?? Very nice. perfect focus, perfect lighting. Is there too much photo on the right? Since he looks left also the compostion looks a bit unbalanced. The focusing is right on, and fortunately enough for you, your camera has a great zoom or you have some really nice lense attatchments. The lighting is excellent. I'm not sure if this is how you intended it, but it appears to be shining on him (as he faces east) in the morning, as he is about to crow. Very nice capture. i would've personally liked it to have either more or less of his body, he seems chopped off prematurely the way it's cropped now. Cute title, good photo, well done! Proudly hosted by Sargasso Networks. Current Server Time: 04/24/2019 06:16:27 AM EDT.